April is California’s inaugural Arts, Culture, and Creativity Month (ACCM)! Its goal is to engage and empower arts supporters to become arts activists in order to advocate for increased public funding for the arts and educate legislators on the impact of arts, culture, and creativity in California. In celebration of ACCM, we are sharing a collaborative moment between our Master Teaching Artist Michelle Mary Lee and her guest artist Francesco X Siqueiros in teaching Ryman Arts students about observational figure drawing, a key building block in fundamental drawing and painting. 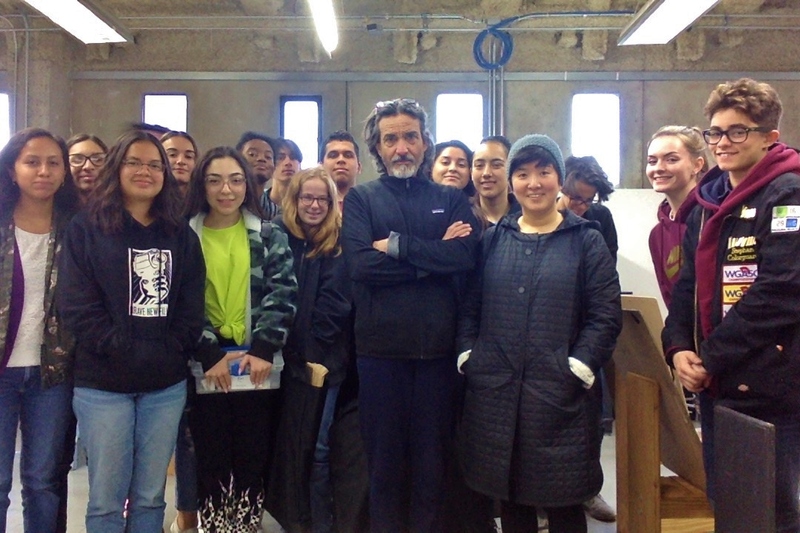 On March 10, 2019, I invited renowned Los Angeles arts educator, print maker, and publisher, Francesco X Siqueiros as my guest artist to expand upon the curriculum’s focus on figure drawing. For the week’s lesson, the students were instructed to capture the likeness of the costumed model, which demanded intense practice of their observational drawing skills. Francesco lead the students through modified contour drawing, a process in which the artist looks intently at the edges, or as he calls it the "topography" of the subject, in this case, outlining the shape of the model while the charcoal pencil moves through the paper without being lifted. Students filled the studio walls with their figure drawings and had mini-critiques throughout the class. They then added form to their drawings, intensifying darks tones and lifting highlights with their eraser. Following Francesco’s instruction, during the latter half of the class, I lead the students in a collaborative drawing session, where the students were put into circles and rotated each minute. Finding themselves in front of another student's drawing, they had to creatively respond their classmates’ drawings while still looking at the costumed model as reference. In the last two minutes, the original artist found their way back to their own art piece which was the whole class had worked on; during this final moment, the artist could "polish" or "finish" their piece. Learning about figure drawing through these various processes – a collaborative effort by me and Francesco – brought about much concentration and discovery and was an invaluable educational experience for the class. Francesco X. Siqueiros is an artist/printmaker and founder of El Nopal Press, publishing fine-art limited-edition prints since 1990 in downtown Los Angeles. He has 20 years of experience, teaching printmaking and drawing in various Universities and Colleges, including UCLA, UCSC, USC, Otis College of Art & Design, Cal State Northridge, and ArtCenter College of Design. Michelle Mary Lee received her double major BA in Art and Art History from UCLA and her MFA and EdD from USC. She holds a teaching credential in Art and is currently a lecturer at UCLA and USC. Dr. Lee has been an AP Studio Art teacher at various high schools. In addition to teaching, she is a working artist. Her selected solo exhibitions include 16 Summertime Paintings, eat.on sunset, Metropolitan Water District (Los Angeles), USC Interdisciplinary Center (Irvine), and Combes Gallery, Paris.